The backlash against this ball finds a parallel in today’s current economic situation, as the excesses of Wall Street and the free-for-all spending of bailout money by executives has evoked as much anger and resentment in people today, as our Gilded Age counterparts were during that eventful night over 100 years ago. While Rome–or in this case, New York City–burned, the Bradley-Martins fiddled. 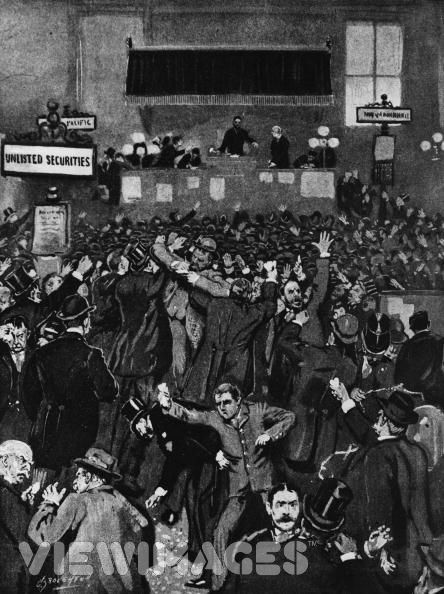 The year was 1897 and since the Panic of 1893, America had been mired in a depression which had its roots in a banking crisis of twenty years before. As a result, Americans were inclined to look upon the lavish spending of the Gilded Age’s idle rich with a jaundiced eye. Having struck a social coup years earlier by marrying their 16 year old daughter Cornelia to the Earl of Craven, the Bradley-Martins moved easily within both New York’s “Four Hundred” and England’s “Marlborough House Set.” During a visit to New York, Mrs. Bradley-Martin was moved by the plight of the city’s thousands and thousands of unemployed, impoverished and hungry, and began to form an idea for alleviating the financial burden of New Yorkers–and their boredom. 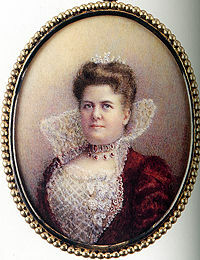 Mrs. Bradley-Martin was the former Cornelia Sherman, and daughter of a wealthy Albany merchant. She met Bradley Martin at the wedding of Emily Vanderbilt to William Douglas Sloan, and they quickly set out to conquer the exclusive society of New York. 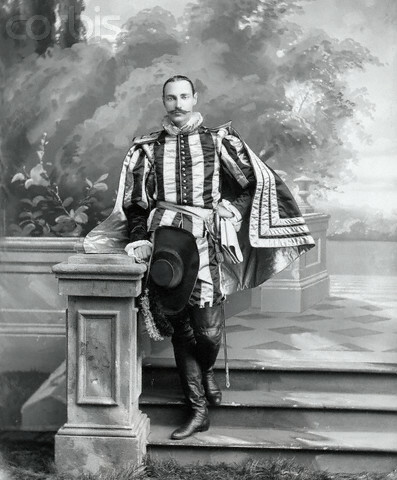 Besides marrying young Cornelia to an earl, Mrs. Bradley-Martin added a hyphen to her husband’s names and set about throwing the most spectacular, lavish parties society had ever seen. A ball held in 1885 was so massive they built a huge temporary supper room in their backyard just for the ball, and the enclosure was so enormous that the insurance companies required that that the Bradley-Martins buy fire insurance for the entire city block. Their balls had always been a hit with both the Four Hundred and the gossip-hungry press, so Mrs. Bradley-Martin rightly divined a gigantic ball held that winter would go over just as easily. But the show went on–with Assistant Police Commissioner Theodore Roosevelt sending ten squadrons of police to surround the hotel against any troublemakers and to cordon off the walkway into the Waldorf. At ten o’clock, tall footmen with powdered hair spread a crimson carpet for guests, and half an hour later, carriages clip-clopped down Fifth Avenue carrying their time-traveling occupants through the jammed streets. Contrary to fears, the crowds pressing against the cordons cheered and clapped rather than booed and hissed, as the lavishly-attired socialites and their spouses stepped onto the carpet laid for them and entered the hotel. Inside, Mrs. Bradley-Martin and her husband, costumed as Mary of Scots and Louis XV respectively, greeted their guests from atop a crimson dais. The room was filled with hothouse flowers, twinkling electric lights, gilded candelabra, potted palms and crystal and ormolu chandeliers hung with pink roses and asparagus vines. The grande dame of the Four Hundred, the Mrs. Astor came as Mary Stuart in a gown of dark-blue velvet and some $200,000 worth of jewels (Right: her son, Titanic victim John Jacob Astor IV). Among the hundreds of guests invited, there were duplicate costumes, with three Catherine the Greats, eight Madame de Maintenons, ten Madame de Pompadours, and a host of courtiers, cavaliers and courtesans. Oliver Belmont took another route, arriving in a suit of gold-inlaid armor worth about $10,000, that was so heavy, he could barely move. Soon after arrival, the guests began to dance, opening the ball with the quadrille de honneur, and several hours later, they sat for a 28 course supper that included caviar-stuffed oysters, lobster, roast English suckling pig, terrapin, canvasback duck stuffed with truffles, and plover’s eggs–all washed down with four thousand bottles of 1884 Moët et Chandon. By the time the evening had ended, the Bradley-Martin’s spent $369,000 (apprx $8.5 million in 2008 dollars). The following morning, all was well. Newspapers enthused over the display and the opulence, each one fighting for exclusive details of the ball with which to regale their less fortunate readers. Soon however, the press began to look for a new angle to keep the story fresh and as lavishly as they praised the ball, they rushed in to condemn it. Within days, the Bradley-Martin ball had taken on monstrous proportions and the couple and the ways of the Four Hundred were viciously condemned. Many current accounts have the Bradley-Martins fleeing the attacks, but in reality, though smarting by the volte-face, their decadent party caught the attention of the New York City tax authority, who brought a suit in court in which they asserted that the Bradley-Martins’ property wealth was higher than reported and the city could collect a higher property tax from them. The suit was dismissed as the couple lived in both England and America and rarely stayed in NY longer than the social season. In the aftermath of the scandal, the Bradley-Martin’s remained in England, to return to American shores but once fifteen years later.